Stephen Burn vividly remembers coming off Mount Maunganui’s Main Beach beach as a frozen five-year-old nipper, blue lips and shaking, and being treated to a deliciously hot, sugary cup of tea, dispensed in a giant ceramic teapot. Cheryl Leuthart (nee Lawson), meanwhile, used to drag her feet on the way to nippers on a Sunday, hoping to avoid the soft-sand warm-up run down to the toilet block and back. 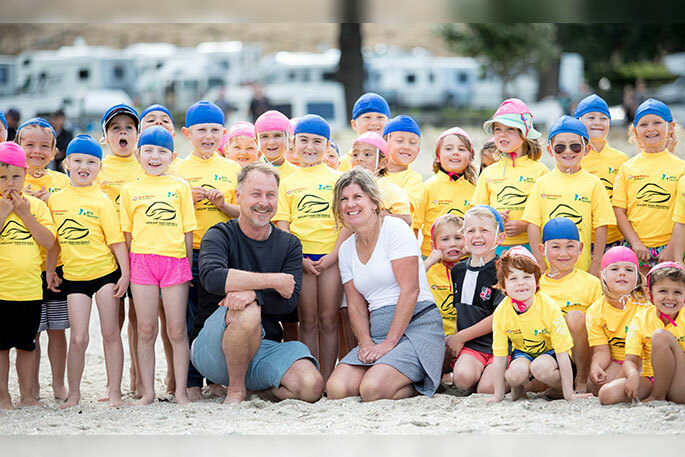 The pair were able to reminisce over the weekend, as the Mount Maunganui Lifeguard Service celebrated 50 years of running a nippers programme. Burn was in the very first intake in 1968, while Leuthart joined up as an 11-year-old in 1975, the year girls were allowed in. Amid the celebratory cake, the mayoral address, the ceremonial march-past and the cacophony of this year’s nippers intake engaging in games, there was also a bit of irony. Tea-loving Burn, it turns out, now owns a coffee business on Waiheke Island with wife Jane, while run-loathing Leuthart has turned into a trail-galloping guru. Now living in New Plymouth, she coincided her trip back to the Mount with a win in the Taniwha half marathon along the Waikato River Trails on Saturday. “Little did I know I’d actually grow to quite like running!” she laughs. 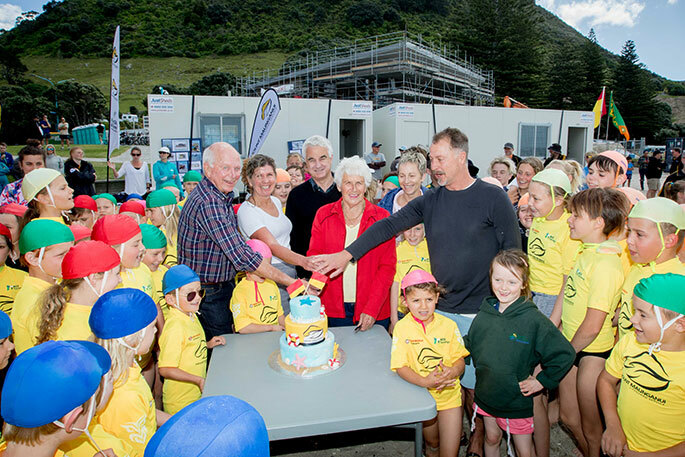 Dignitaries, including Tauranga mayor Greg Brownless, John Burn, Shirley Youngman, Cheryl Leuthart, Karen Kurtovich and Stephen Burn cut the cake celebrating 50 years of nippers at the Mount Maunganui Lifeguard Service. Photo by Jamie Troughton/Dscribe Media. Mitchell was the pre-eminent figure in local nippers history - he and wife Shirley were in Sydney on holiday in early 1968 when he went back to his old club, North Cronulla. There, he saw some of the first Australian nippers in action and he vowed to bring the concept back to Mount Maunganui. The first club meeting was held on November 2 1968 and attracted 41 boys, with Mitchell as president and John Burn - father of Stephen - secretary. Many of the founding members were wharfies with young families. Initial activities included pillow fights, tug-o-wars, musical flags, sack races and surfo-planes, while the first subscriptions cost 50 cents, plus $2.10 for togs. Mount’s innovation was quickly picked up by other clubs; the likes of Whakatane, Waimarama and Piha were quick to write to Burn asking for information on how to set up the programme, with an Auckland Nippers’ Championship held in 1970. Sadly, Mitchell died in an accident on the wharf in 1978 but Burn Snr and Mitchell’s widow Shirley (now Youngman) were on hand to help celebrate on Sunday, along with another of Burn's progeny, daughter Karen Kurtovich, who was also part of the 1975 girls' intake. “I guess you’ve got to say it’s achieved its purpose over those years,” says John Burn. 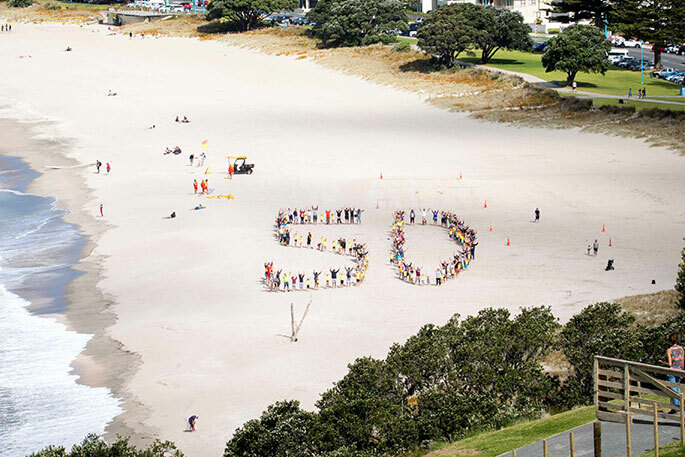 This season’s nippers and their supporters form a giant 50 on the Main Beach to celebrate the Mount Maunganui Lifeguard Service nippers milestone. Photo by Jamie Troughton/Dscribe Media. Those first Mount nippers also got to pioneer other surf lifesaving innovations. The club was one of the first in the country to introduce inflatable rescue boats for patrolling. “There’s some really strange things as you age - I often forget what I did yesterday but I can tell you the spark plug number for a Johnson outboard motor was an L77J4!” says Cheryl. “And we could strip an engine down after we’d sunk it, empty all the sand and reinstate it within 12mins!” says Stephen Burn. The pair were also there when the club rebuilt in 1978, back when Mount Maunganui was still a sleepy seaside town that only came alive for a few weeks over summer. That building was demolished in April to make way for the fourth iteration of the clubhouse - a $3million project which is expected to be finished early next year. It will cater for Tauranga’s booming population and the greater demands on lifeguards as first respondents, although another $200,000 is still needed to complete the project. - Nippers is a surf lifesaving programme for kids aged from 5-13. - The nippers movement started at the Nambucca Heads club in New South Wales in 1961, with North Cronulla becoming the first Sydney club to pick it up in 1963. - Several NZ clubs - most notably South Brighton in Christchurch - had activities for ‘junior juniors’ that included swimming training and participation in the march past at carnivals. - Bob Mitchell brought the nippers concept back to Mount Maunganui in 1968, after visiting his old club, North Cronulla, on holiday. - Piha, Waimarama and Whakatane were among other clubs who requested information and soon established their own nippers programmes. - Girls officially joined the Mount Maunganui nippers in 1975 and the nippers club was officially incorporated into the MMLS in 1982. 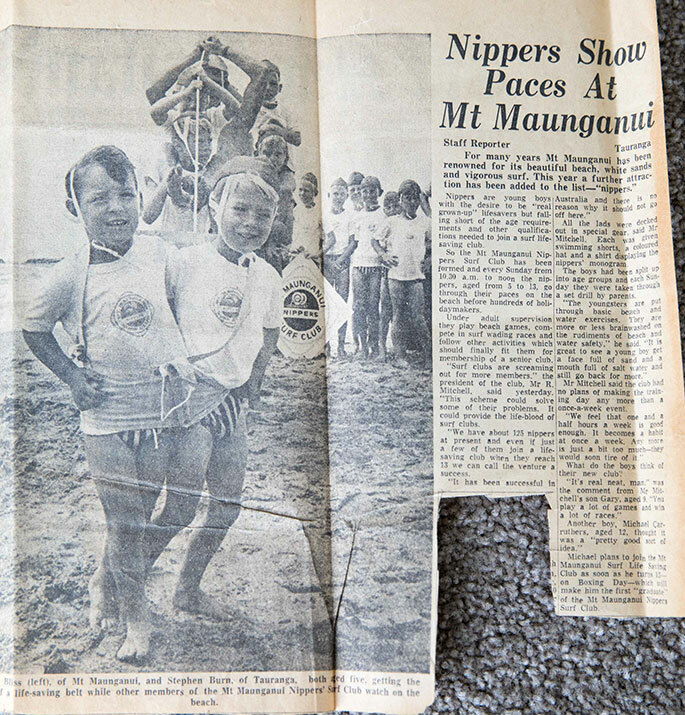 A newspaper clipping from December 1968, featuring Grant Bliss (left) and Stephen Burn amongst the first nippers at the Mount Maunganui Lifeguard Service.